Monitors Inc. recognizes that Government customers have unique, varying requirements. Our team of Government specialists is ready to assist you. Whether you are purchasing a single display or a quantity acquisition, we are equipped to support your needs. We accept Government issued purchase orders and credit cards. You can rely on our staff to provide you with the highest quality service in the industry. This team has over 60 years of Government contracting and sales experience. Our GSA contract number is 797P-3164M for goods listed in section 6525. Knowledgeable, personalized service and contract compliance is the keystone of our business. We stand behind our commitments and our contract with you. 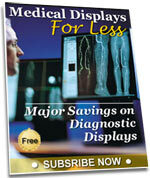 We offer the broadest selection of display solutions available. We specialize in medical grade LCD Displays and accessory items to support a single source shopping experience for these goods. We understand that many customers do not have the time or inclination to study every aspect of a rapidly changing technology in their procurement decision. We pride ourselves on having the most knowledgeable display specialists in the industry to support you and save time. You can feel confident in discussing your needs with us and the solutions we present. We are committed to providing you with the best possible equipment value and shopping experience! We look forward to your hearing from you.